Increasing values here represent more different skiers finishing at that level. 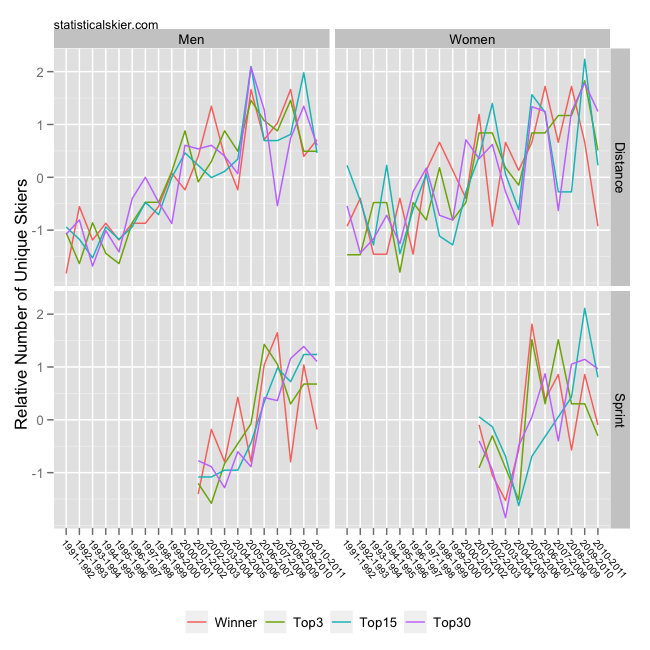 Note that the Winner and Top 3 lines have taken a major tumble for the women, particularly in distance events. That’s about what we’d expect given the seasons that Bjørgen, Kowalczyk and Johaug have had recently. 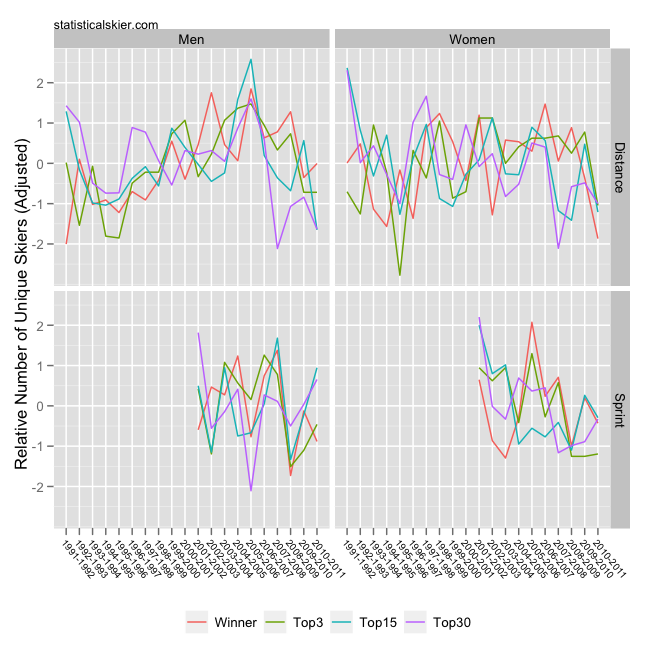 Note that overall, the long term trend appears to be towards more skiers vying for the top spots across the board. However, I haven’t adjusted for something important, the number of races per season. Since the early 90’s there’s been a steady increase in the number of distance races per season, and a dramatice increase in the number of sprint races. More races leads to skiers attending a smaller proportion of the schedule, which in turn will lead to more different people winning, being on the podium, etc. What happend when we adjust for this? The upward trend for the sprints has basically entirely disappeared, and in fact things have gotten somewhat less competitive with the women it appears. Interestingly, the women’s distance panel still shows a dramatic dropoff in the last two seasons but historically has been fairly stable, while the men’s distance events appears to still show a generally upward trend until around 2007 or so. Since then we seem to have seen a rather dramatic fall in overall competitiveness. Tour de Ski is a tempting explanation, but remember I’ve already adjusted for the increased number of races, so something else is probably happening here. Posted by Joran on Monday, August 1, 2011, at 6:00 am. Filed under Analysis, Cross Country. Tagged competitiveness, World Cup. Follow any responses to this post with its comments RSS feed. You can post a comment or trackback from your blog. « How Often Do Ties Occur?